We are counting down to “Masquerade,” what we hope will be an amazing two-day celebration of art and experiences her at The Kay. The lobby has been draped, more masks have arrived just today, cocktails have been mixed and sampled, more wine is being delivered today, the art is hung . . . All that’s left is for the doors to open and for our guests to join us! There are still tickets available for Friday night and Saturday night (not for dinner, which is sold out). $35 buys you a great event, yummy food, wine and beer, and the opportunity to support our good work through Raise the Paddle for scholarships or buying a wonderful piece of art or a memorable experience. Our breezeway, previously home to the amazing Fourth Grade bird paintings, is sprouting something new and amazing. Keep watching. It’s going to be good! For reasons I can’t explain, seeing the emerging breezeway wall put me in mind of a 1967 classic, For What It’s Worth, thus the title of this post. Enjoy! If you’ve listened to music in our theater you know two things. The first is Chorale, Opera, orchestral, really anything that isn’t amplified sounds fabulous. The room is brilliant and the sound “complex” (a term I learned from one of our great island sound mavens, Martin Feveyear). The second is that amplified music has been a less than satisfying experience. It’s actually been quite fabulous when we’ve brought in national touring acts because a) they bring their own gear, or b) we have paid to rent the equipment they specify in their tech rider. When those acts are not in our building, we’ve struggled to piece together a good sound with the PA system we own along with gear we beg and borrow from folks on the island. As of this week, those days are officially over. Some months ago we received a proposal from the folks at Carlson Audio in Seattle. They had a line on a “lightly used” system from a mega church on the East Side. The gear was absolutely top shelf, to the standards of national touring acts, and we could have it. So, with Harry Potter clearly in mind, we created the “Ministry of Sound and Light” and raised the money we needed. We turned it on for the first time Wednesday with some recorded music. All I can say is wow. The sound is crisp and clean across the full range. You can hear fingers squeaking on guitar strings. You can actually understand the words. It’s plum amazing. Two of our great team members, Joe Panzetta (part of the great local band, Saint Ophelia) and Ian Metler (many know him from Trolls Cottage back in the day) properly christened the system Thursday morning with an impromptu live song by Ian. This recording doesn’t begin to do it justice, but enjoy it anyway! The first live concert on the new system will be Sweet Dreams, the Music of Patsy Cline (tickets still available), followed by the Saint Opehlia (tickets still available), and Judy Collins (sold out). Come on down and give us a listen! My favorite moments here at VCA all involve the young people that spend time on our campus. 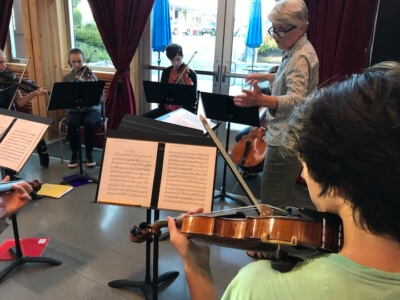 To my great pleasure, the youth string orchestra is back this week, practicing under the drapes and lights in our lobby. A bushel of thanks to Gaye Detzer for all she does! They’re still working on it, but this is what they were playing. Enjoy! I’ve been remiss in not shouting about this sooner. On July 18 (yikes) we were notified we had been granted $50,000 by the PSE Foundation Board of Directors to purchase and install a large emergency generator for our building. The Katherine L White Hall is part of the island-wide network of emergency shelter spaces and this will take us another step towards making our building an anchor resource for the community. While we’re working on procuring the gear, a couple of our team members had the opportunity to go to a Mariners game as guests of PSE at which all the grant recipients were honored. Go Mariners. Go VCA. Go Vashon preparedness! We’ll do a proper ribbon cutting when the new equipment is finally here. I found these two delightful dance videos the other day. Even if you think you “don’t like dance,” You’ll like these.